As the global consumption of packaged food continues to rise, demand for food packaging products is also increasing. Manufacturers are actively focusing on technological advancement and product innovation in order to cater to the changing needs. Compact packaging is the new trend and manufacturers are quickly realising the market opportunities in such categories. Over the years, spoon in lid packaging has emerged as an innovative and compact packaging solution. The particular packaging solution has received a positive response from both end-users owing to the convenience it offers, negating the need for carrying extra spoon. At the same time, such packaging concepts also work well for marketing, branding and over all presentation of a product. As such, the product often attracts more consumers when kept on display shelf. The spoons that are affixed in the lid is sturdy, lightweight and stays intact. The aforementioned factors are expected to drive the adoption of spoon in lid packaging in the years to come. 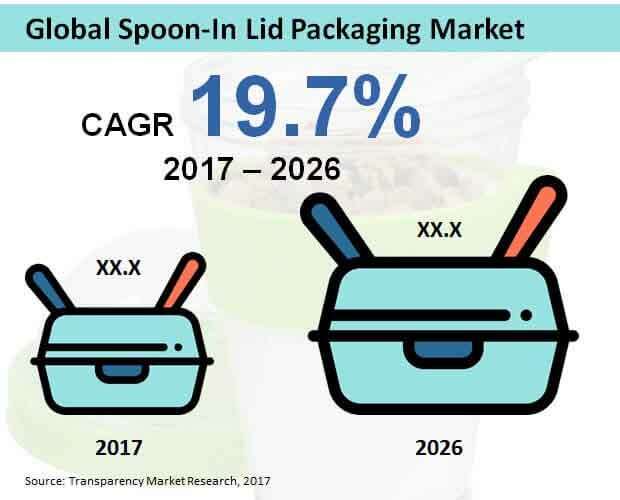 As per the latest report published by Transparency Market Research (TMR), the global market for spoon in lid packaging is set to grow from US$ 309.7 Mn in 2017 to US$ 1,558.8 Mn in 2026, reflecting a CAGR of 19.7%. In terms of revenue, Europe market is expected to spearhead the global spoon in lid packaging market in 2017 and beyond. The region’s market is projected to surge at a CAGR of 19.5% during the assessment period. This is primarily owing to the growing popularity of packaged food items across the region. On the basis of material type, the Polyethylene (PE) segment is expected to remain highly lucrative over 2026. The segment currently represents for more 33% revenue share of the global market and is expect to surpass a valuation of US$ 500 Mn by 2026, expanding at 19.8% CAGR. The segment is likely to grow by US$ 84 Mn annually over the course of the forecast period. Based on application, the dairy product segment is expected to hold its top position throughout the assessment period. Currently, the segment account for more than 50% market share in terms of revenue. Towards the end 2026, the segment is estimated to reach a market valuation in excess of US$ 900 Mn, increasing at 21.5% CAGR. By packaging format, the cups segment will continue outperform the tubs segment. The cups segment is expected to surpass a valuation of US$ 400 Mn by 2026, reflecting a double-digit CAGR. Some of the key players operating in the global market for spoon in lid packaging include SP Containers, Polyoak, Plasticos Regina, ITC Packaging, RPC Group, Fourmark Manufacturing, Greiner, Coveris, Parkers Packaging, and Fairpoint Plastic. Transparency Market Research (TMR)’s report offers an in-depth analysis and forecast of the spoon in lid packaging market on global, region and country level. The forecast on the market has been presented on basis of (US$ Mn value) for the period from 2017 to 2026. The report includes key drivers, opportunities, restraints and trends influencing the global spoon in lid packaging. It also present an overview of the intensity of the key elements in the spoon in lid packaging market. In this report, the reader will gain access to vital information regarding current trends and future propositions of the market. The report covers elements such as the market attractiveness analysis wherein key segment are benchmarked on the basis of market size, general attractiveness and growth rate. The study delivers a decisive opinion of the global market for spoon in lid packaging by analyzing it in terms of material type, application, packaging format and region. These segments have been analyzed on the basis of current and future trends. The regional segmentation includes the current and forecast assessments for the spoon in lid packaging market in North America, Europe, Asia Pacific excluding Japan (APEJ), Latin America, and the Middle East & Africa (MEA). Also, readers will gets insights into key country/sub-region markets for spoon in lid packaging. The report provides the estimated market size of spoon in lid packaging for 2016 and forecast for the next ten years. The global market size of spoon in lid packaging has been provided in terms of (US$ Mn value). Market figures have been estimated based on material type, application, packaging format, and regional segments of spoon in lid packaging market. Market size and forecast for each major segments have been provided in terms of global and regional markets. A highly credible research methodology has applied to compile the research report. Exhaustive interviews and discussions were conducted among industry participants, market experts and opinion leaders. Primary and secondary research represents the bulk of research efforts, taken by the analysts. For resourcing information key players’ product literature were viewed along with press releases, annual reports, relevant documents for drawing comparisons and making decisive judgments. Secondary sourcing also includes a probe on recent trade, statistical data from government websites, online sources, data for trade associations, and agencies. This allowed analyst to gather highly reliable and efficient data, making it successful approach for obtaining precise market values, capturing industry participants’ insights, and identifying business opportunities.